Hollywood makes up for that week of repeats with three new wide releases, though your level of thanks for these three films may vary. January isn't entirely a dumping ground anymore, but we're still getting a lot of also-rans in the mix. Leading the way for new films is Daybreakers, the Hollywood debut of the German duo of the Spierig Brothers, who up till now have specialized in Australian horror films. Approximately the 70 bajillionth vampire film in the last three years, Daybreakers is set in a world in which the vampires have won. Ten years in the future, a plague has turned everyone into bloodsuckers, and the entire world exists only in darkness. The problem with that, in a none-too-subtle metaphor for the energy crisis, is that it means that the blood supply is close to running out as the vampires drain the remaining humans for food. 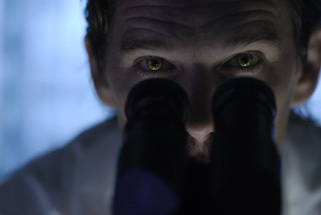 A group of environmentalistssurvivors kidnap the chief hematologist of the vampires (Ethan Hawke) in order to create a cure. It's a race against time as the vampires attempt to run these scattered remaining humans down, even if it would likely doom the rest of the world. Also starring Sam Neill and Willem Dafoe, the film is a mix of sci-fi and action and a touch of horror. Unfortunately, it arrives at a time when vampire horror action is at its lowest point. The Underworld series finished with a thud early last year, we're several years past the last good Blade movie, and Twilight's turned the world's vampire fans into puddles of co-dependent goo. Still, with surprisingly positive reviews and an appropriately moody trailer, this has a chance to be a modest hit. Its stars won't help it much – the last thing approaching a hit for Hawke was 2001's Training Day, and that's hardly on him – but it's got some fight in it based on genre. Look for around $15 million for an opening weekend.